Sally Adler and Melissa Raman Molitor came to SCORE in November 2007 with the idea of starting a business based on a new concept for an art center, one that utilizes the many benefits of art in working with children. Art therapy is an established mental health profession that uses the creative process to enhance the physical, mental and emotional well-being of individuals of all ages. Both Sally and Melissa have backgrounds in fine art, education and art therapy. Sally was a Senior Art Therapist and Art Therapy Program Director at Stroger Hospital, and Melissa was an adjunct professor at the School of the Art Institute of Chicago and founder of Connection Arts, a not-for-profit located in Chicago. Working with SCORE counselor Mitchell Morris, they refined and enhanced their business and marketing plans and developed a strong cash flow statement. They then went to National City Bank, which provided them with a line of credit to get the business going. art & soul had its grand opening on May 31, 2008 at 5347 N. Clark Street in the Andersonville neighborhood of Chicago. 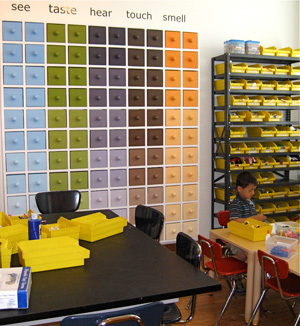 Replete with a custom-built “sensory wall”, full ceramics facilities, a child-centered art studio and a private “wellness room” for art therapy and counseling, art & soul provides a unique place for kids to play, learn, explore, grow and heal through art.